Did you hear about the doomsday prepper in Blue Springs, Missouri, who died after accidentally setting off his own booby trap? 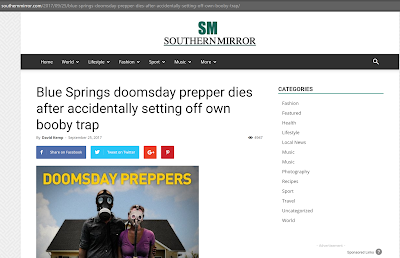 What about the doomsday prepper in Monroe, Tennessee, who died after accidentally set off his own booby trap? Both stories appeared on SouthernMirror.com. In each story, the prepper was a 46-year-old man named Doug Curtis. The same story also appeared on JacksonTelegraph.com, although the setting for that version was Jackson, Mississippi. Obviously, SouthernMirror.com is a fake news site. It's one in a long string of them.